Franklin Dollar was born on the wrong side of the digital divide. Such conditions no doubt prevent many Native Americans from achieving their full potential, but Dollar says some crucial factors in his youth enabled him to become what he is today: an assistant professor of physics & astronomy at the University of California, Irvine and head of a lab studying ultra-high-intensity plasma physics. Dollar, great-grandson of Pomo Indian matriarch Elizabeth Cordova Dollar, says his tribe prevailed for more than 5,000 years along the banks of the Russian River in present-day Sonoma County because of its strong familial bonds and sense of community. That connection to others has been vital to him throughout his academic career. During his first couple of years at UC Berkeley, Dollar worked at a chain drugstore. Then he heard about some of the undergraduate research opportunities offered by the university. Via the UC Leadership Excellence Through Advanced Degrees program, he got a job conducting research at the Lawrence Berkeley National Laboratory. His time at the lab was also his first contact with the world of imaging physics. He was part of a team developing advanced optics for NASA’s Solar Dynamics Observatory. Its focus was creating sensors that could pick up X-ray frequencies from iron at various temperatures in the roiling, hot mass of the sun, giving scientists a tool for mapping the star. Dollar cultivated a strong understanding of X-ray physics and the processes required to fabricate and test curved optics just a few dozen atoms thick. After earning a Ph.D. in applied physics at the University of Michigan in 2012, Dollar became a postdoctoral scholar at the University of Colorado Boulder’s JILA institute. 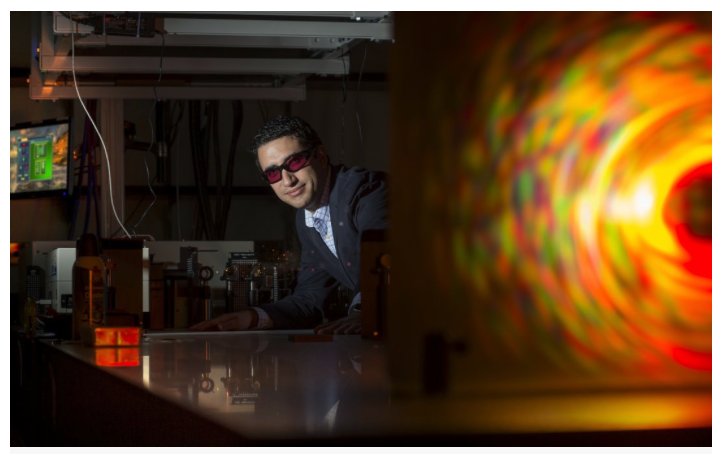 He investigated X-ray source production with high-intensity lasers, a pursuit he has continued in his own lab since joining UCI’s Department of Physics & Astronomy in the fall of 2015. He also participated in drafting a proposal to procure National Science Foundation support for a new Science & Technology Center to explore how imaging modalities such as X-ray, optical and electron microscopy can be improved and combined to help answer some of the most complex and challenging questions in medicine, chemistry, physics and other areas of science. The effort paid off; last fall, the NSF announced a five-year grant of $24 million to fund the Science & Technology Center on Real-Time Functional Imaging, with Dollar as head of its work here at UCI. Boasting research locations at UCI, UC Berkeley, UCLA and the University of Colorado Boulder, as well as education sites at Fort Lewis College and Florida International University, STROBE – as it’s called – will meld cutting-edge imaging research with learning outreach to underrepresented populations, with a focus on Native American and Hispanic students. The center is designed, in effect, to mint more Franklin Dollars. “Our mission is student success, and that comes in the form of increasing representation everywhere optical science exists, including policy, law, industry, entrepreneurship and the other nonacademic positions that most of our students will end up in,” he says.